Milani Orange Burst. Great shimmer with a bit of iridescence to it. Maybelline Vanishing Venus. Purplish-brown with green duochrome/shimmer! BB Couture Joker. Perfect bright blue-purple with a little shimmer. 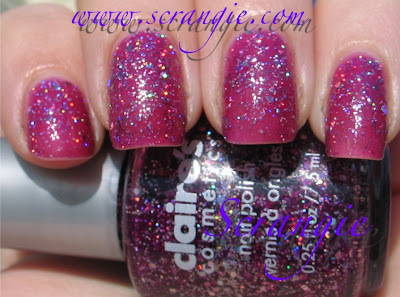 Claire's Galaxy. Purple/Fuchsia version. There's also a black with glitter called Galaxy. Orly Opal Hope. Tons of crazy awesome green duochrome/flash/shimmer that's not visible in this picture. It's amazing. Zoya Bijou. Neon glass fleck jelly? Hell yeah! What a lovely array of pretties! Love the dark teals and greens, but so many of the others have the glowy look about them. Love! Happy 2010 to you! Love that Hot Topic glitter (I am such a sucker for glitter) and am now ordering Zoya Bijou when I order my Zoya Reverie polishes!!!! Every single one looks amazing! you know what? :) As far as I really dig your "real" blog entries, your reviews and stories (I love your stories :)), I nevertheless like the "random polish" pictures, especially when I'm bored and want to look at pretty pictures and pretty nail polish. So, maybe, just maybe, when you are tired or not in the mood of posting a "real review" of something, could you post random polish pix? Your blog and pix are a real inspiration and a GREAT (I mean it!) help when looking for a certain color or brand or when I'm just not sure if the polish, that looks so nice on ebay or in an e-tailer-store, is really a good color ... your pix have been such a great help for me for over a year now, I really thank you for that! Could you do a comparison of Vanishing Venus and Scrangie? Happy New Year to you all! I hope that 2010 brings us all joy and happiness - and lots of cool new polish! The random polishes are very lovely, and I agree with the other posters who enjoy the random colours. I just bought my first Milani (it is being carried at our one grocery chain here, Loblaws Superstore), and am looking forward to trying it. Thank you for all your hard work, and all of the inspiration you provide! Oh my goodness! *drool* to the NARS polish and the Deep Amethyst. Beautiful colors! Love the pix--especially NARS Mash and Maybelline Vanishing Venus. O.M.G. the savvy deep amethyst is sooooooooo gorgeous!!! I need to not think about this color! My jaw dropped when I got to Zoya Bijou. The Amethyst is tdf too. Thanks for the lovely pics! The Milani Orange Burst looks exactly like a Milani polish I have called Just Peachy.. Weird! I love the Hot Topic Turquoise Glitter and the deep amethyst! I would love to combine them together and make a ring with them. Wow, love the sparkles and glitter. Hi! I´m writing from Brazil! I recently bought the Orange Burst Milani. And I just saw I made a great choice. Thank U for showing me!